Hello, My name is Adrian Chambers and welcome to our web pages on Lasting Powers of Attorney. 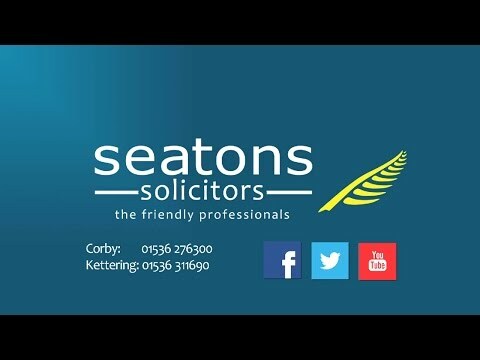 If you’re thinking of making a Lasting Power of Attorney then we at Seatons are specialists and can provide you with friendly and helpful information and advice and offer a fast and low cost legal service and aim to sort everything all out for you quickly and easily. If your thinking about making a Power of Attorney, contact us via telephone 01536 276300 or use our online contact form. This frequently asked questions relates to the more general questions that you might have. If you have specific questions about Lasting Powers of Attorney then please browse through our Lasting Power of Attorney pages or alternatively call us and we would be delighted to have a chat with you and answer any questions that you have. We hope this page answers any questions you may have. If you want to know something that is not covered on this page or the web site then please contact us and we would be delighted to help. We have tried to make our site easy and accessible for everybody to use. We also believe that we offer excellent value for money compared with obtaining legal services in a more traditional manner. Unlike many other legal services available on the internet, we are a professional firm of solicitors and are legal specialists. We know what we are doing. Below we have listed some of the common questions that people may ask about ourselves and Lasting Powers of Attorney. One of the most asked questions. Please don’t worry. We always explain everything in plain English. We are also known as ‘the friendly professionals so we are very approachable and easy to get on with. If at any point, you don’t think you understand the legal process or what is happening with your matter, then we will assist you promptly and explain it in a way so that you do understand. Free Advice – What’s The Catch? There is no catch. We genuinely offer free no obligation advice relating to Lasting Powers of Attorney. Of course we hope that once you’ve spoken to us that you will use and instruct us to act for you. However, there is no obligation and if you don’t want to take any action or even want to go elsewhere then that’s not a problem. Please call us on 01536 276300 or 01536 311690. It depends on the type of matter. Sometimes our solicitors are in Court or have a day full of appointments so it is hard to get back to you immediately. However, we have a great support team at Seatons and someone will be able to take your query and give you a time estimate of when you can speak to your legal advisor. We will always try and respond by phone or email within 24 hours or by post within 3 working days. A Lasting Power of Attorney is a legal document whereby you appoint other people to be authorised to make decisions on your behalf. This is the person who makes the Lasting Power of Attorney. This is a individual who you nominate to manage your affairs on your behalf. A Lasting Power of Attorney can be used even if the Donor loses their mental capacity, whereas a General Power of Attorney ceases to have effect if the Donor loses their mental capacity. Yes, there are two different types of Lasting Power of Attorney. There is a Lasting Power of Attorney relating to your property and financial affairs and a Lasting Power of Attorney in relation to your health and well-being. Can I Have Both Lasting Powers Of Attorney? Yes, you can have just one or both types of Lasting Power of Attorney. The attorneys can be the same, or they can be different. Anyone over the age of 18 can be an attorney in your Lasting Power of Attorney. Usually it is close family members. When Can An Attorney Make Decisions? An attorney can only make decisions on your behalf once the Lasting Power of Attorney has been registered at the Office of the Public Guardian. An attorney under a Health and Welfare Lasting Power of Attorney can only make decisions when the Donor loses mental capacity. There isn’t a limit on the number of attorneys you can appoint. It depends on your individual circumstances. Usually, 2 attorneys are appointed. Can I Restrict My Attorney’s Powers? Yes, within the Lasting Power of Attorney you can place restrictions on how the attorneys act on your behalf. You can also specify guidance of how you want your attorneys to act. Can Attorneys Make A Gift On My Behalf? Usually, attorneys are not authorised to make a gift on your behalf without the approval of the Court of Protection. This applies even if the gift benefits the Donor. If an attorney wants to make a gift on the donor’s behalf, they should seek legal advice. Can My Attorneys Put Me Into Residential Care? Under a Health and Welfare Lasting Power of Attorney, your attorney can decide to place you into residential accommodation as long as it is in your best interests. Can My Attorneys Sell My House? Your appointed attorneys can only sell your house if the property in question is in your sole name. If the property is owned jointly, the attorneys would have to discuss with the other owners. If the attorney is one of the owners, they cannot sell the house as a trustee would need to be appointed. When Do Attorney Powers Cease? The power of the attorneys cease if the become bankrupt, lose their capacity or if they die. Their authority also ceases on the death of the Donor. Should I Have A Replacement Attorney? Appointing a replacement attorney can be beneficial in case something happens to your original attorney. You are not obliged to have a replacement attorney. When Can I Register A Lasting Power Of Attorney? You can register your Lasting Power of Attorney at any point after it has been executed. Usually it takes about 3 months for a Lasting Power of Attorney to be registered. We recommend registering your Lasting Power of Attorney once it has been executed to avoid any inconvenience later down the line. The current registration fee to register a Lasting Power of Attorney is £130.00. Do I Need To Inform Anyone? If you have two certificate providers, then you do not need to notify anyone. If there is only one certificate provider, then you are obliged to notify at least one person. This is to safeguard and prevent a donor being forced to create a Lasting Power of Attorney. Anyone other than an attorney can be notified. It is usual to notify a relative or friend. This is a person who can certify that you have sufficient mental capacity to create a Lasting Power of Attorney and that you are not being forced to create one. Usually it is a professional such as a solicitor or doctor, alternatively it can be someone who has known you for more than 2 years. If your Lasting Power of Attorney is challenged in anyway, the certificate provider would have to demonstrate why you had mental capacity and confirm that you were not influenced into creating the Lasting Power of Attorney. Anyone over the age of 18 who is not an attorney can witness your signature. A further requirement is that they cannot be an employee of the attorney. What Happens If I Have Not Made A Lasting Power Of Attorney? If you have not made a Lasting Power of Attorney and you lose your mental capacity, the only way an individual can be appointed to manage your affairs is through the Court of Protection.